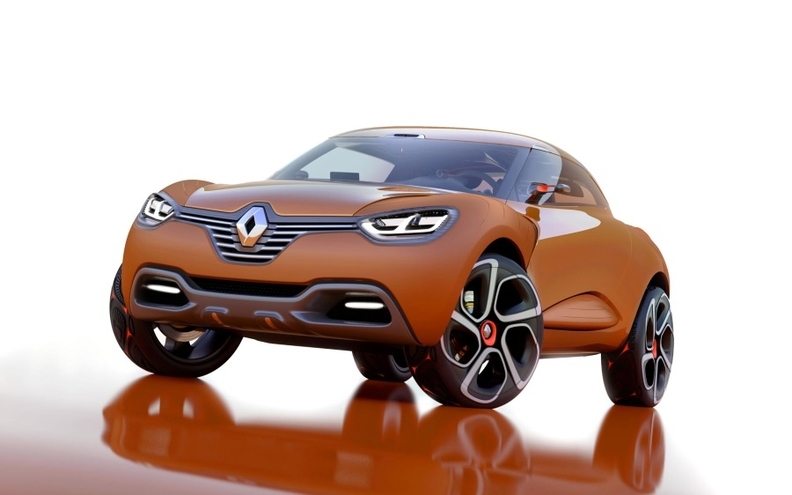 The Captur concept has Renault's logo as its centerpiece. Renault will unveil a crossover concept at the Geneva auto show next month that shows the latest development of the company's new design strategy. Called Captur, the muscular-looking crossover has the brand's new frontal identity that features a large Renault logo as its centerpiece. The concept is powered by a 160-hp 1.6-liter twin-turbo diesel engine with CO2 emissions of 99 grams per kilometer. The Captur is Renault's second concept after the DeZir two-seat electric coupe that was unveiled at the 2010 Paris auto show. Six concepts are planned. Renault said its new brand identity is founded on different stages of the human life cycle, with each phase taking the form of a specific concept car. The DeZir expressed ‘falling in love,' the passion present at the beginning of any new adventure. Captur addresses the second phase of this cycle, "that of two people exploring the world around them," Renault said. “Captur is a fun and sporty crossover, ideal for a young couple about to discover the world” said Renault's director of design, Laurens Van den Acker, in a statement. The concept debuts two new technologies. One is a mechanical self-locking differential that improves traction on slippery roads and tracks by transferring all or part of the engine's torque to whichever of the two driven wheels has the most grip. The other is a system that uses a forward-facing camera to embed real-time pictures of the road ahead on a central screen.